We value our patients' experience at Thibodeau Chiropractic. If you are currently a chiropractic patient, please feel free to complete the following Client Experience Questionnaire. The Questionnaire is in Adobe Acrobat format, and requires the free Acrobat Reader to view. Dr. Thibodeau is proud to care for infants, adolescents, young and older adults at his Soquel chiropractic office. What others say about chiropractic care can help you make the right health care choice. Naturally, chiropractic helps traditional neck and back problems, but chiropractic has also produced wonderful results with a variety of other health problems, such as dizziness, extremity numbness, and even skin issues. These conditions respond well to our advice and adjustments. If you have been to see other chiropractors in Soquel without results -- give our office a call! Dr. Thibodeau has helped many Santa Cruz & Aptos families who went from doctor to doctor and finally found results in our office. Review a selection of Thibodeau Chiropractic patient testimonials below and please email me or contact the office if you have any questions. As many as 1 in 5 people with diabetes get frozen shoulders. I don’t know if that is enough for us to consider it a complication of diabetes or not, but I do know that both of my shoulders have frozen since a doctor diagnosed my diabetes 10 years ago. It can last for five years. Frozen shoulder is something of a misnomer. Your shoulder doesn’t actually freeze. Instead you can’t move it like you could before. Frozen shoulder is a joint problem, technically called adhesive capsulitis. One Saturday night a couple of weeks ago I woke up and felt considerable pain when I reached above my head or across my body, classic initial symptoms of frozen shoulder. It was the same as what I felt in 1994, except then I went to my doctor. The doctor that time referred me to a physical therapist, and within six months I was back to normal. I was lucky. With normal treatment the condition can last for up to five years, according to the American Academy of Orthopaedic Surgeons. Remembering how long that treatment took and how painful it was, I chose a different course this time. On the Monday following the attack I had the first of four sessions with my chiropractor, Peter Thibodeau, DC at his Soquel Chiropractic office. Dr. Thibodeau told me how good it was that I came to him as soon as I could before scar tissue could form. Consequently, after just one week I was back to normal with full range of motion and no pain. David M.
This past weekend I was enrolled in a continuing education seminar. The last 4 hours of the day featured a most remarkable speaker. His name is Dr. Peter Thibodeau DC. He has practiced chiropractic in the Santa Cruz area for the past 40 years, or so. He teaches at no cost to the profession, which is amazing in itself. He was donating his time on behalf of the International Chiropractic Association, an organization that he has been involved with for many years. On this day he would share with us his thoughts and abilities on the art of chiropractic adjustive technique (Manipulation). At 67, Dr. Thibodeau is in tremendous physical and mental shape. He follows a rigorous daily exercise program that has him doing, among other things, pull-ups with 90lbs attached to his waist, one-handed pull-ups, dead lifts, heavy squats and bench presses. This is just a small part of his routine. He also does daily cardio in some form. I’m guessing he’s about 6' 1? and maybe 175 lbs and very lean. I mentioned he’s only 67, right? He describes himself as “Overly enthusiastic”. I’d say that would be an understatement. The creed he lives by, and I heard it several times during his class is Eat Well, Think Well, Move Well. He definitely lives by all three. I have decided to make Dr. Thibodeau my role model. I’ve thought extensively how those three things sum it all up. Health can be that simple. However, it’s not easy. It takes effort. As a chiropractor, It is my responsibility to see that people move well at a basic level, taking it to the spinal and joints. What we do is the following. Good motion is essential for the health and nutrition of discs and joints because it permits the exchange of nutrition, fluid and wastes. Having my own spine adjusted on a regular basis is part of what I do to continue to “Move Well.” If we are interested in setting goals with regard to our health, we would do well to consider these three areas and chiropractic care should play a part. When I first came to your Soquel Chiropractic office four years ago, my primary concern was relieving the intense pain in my lower back and, secondly, recuperating as quickly as possible so that I could return to my job as a linen truck driver. My wife and two children were depending on my ability to work. When you treated me on a Sunday afternoon I began to realize what Chiropractic Health Care was all about. Not only was my pain relieved, but I was able to go back to work in a relatively short period of time. With regular care I continued to do the same job for years after the first injury. When my wife had back problems, you were able to relieve her pain and keep her active as a homemaker and later as she went to work outside our home. I would say you are largely responsible for our ability to function in a normal way over the last several years. Not only did you alleviate our physical problems but your interest in me and my family as people as well as patients was totally unexpected and most appreciated. Moreover, your enthusiasm for Chiropractic as a profession was largely responsible for my decision to give up a job I didn't enjoy and pursue a Chiropractic career. The appreciation that we feel for this encouragement cannot be overestimated. For all the kind consideration and personal interest you have shown me and my family, I am especially grateful. If at any time in the future I can be of any assistance to you, please don't hesitate to call on me. Thanks again for everything! As a young boy in the Mid-West I broke colts, and later I had the job of breaking the larger horses. One day I got thrown very hard from one of those mean horses. My spine was all twisted out of shape. I went for years suffering from this injury. The pills the medical doctor gave me didn't help. Then as an older man I came to California and heard of Dr. Thibodeau. He straightened my spine and now I'm just fine and don't have any pain. I'm 87 years old and I come in to Dr. Thibodeau's Soquel Chiropractic office once a week for my adjustment and feel just wonderful." I am writing this letter to let you now how much a Chiropractor means to me. 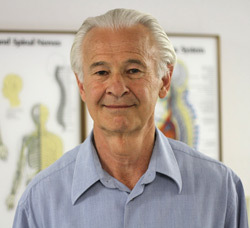 I am 76 years old and have had a Chiropractor, Dr. Peter Thibodeau D.C., for the last twelve years. My trouble is in the lower part of my back (disk and arthritis) and I stay healthier because of my treatments with Dr. Thibodeau. I do not believe in M.D. 's and operations and as yet no operations. My Dr. knows what vitamins I should take and what treatments I should have and I am happy I know within myself the good he does for me. My children are against Chiropractic and some of my friends but they are old fashioned and do not understand the healing and natural workings of our bodies. I am thankful I understand and have the care of Dr. Thibodeau." For seeing with your Heart And helping me get well For the Interest that you show In how I feel and what I do For your Benevolent attitude When I can't pay you. For your Optimism and kindness Doctor, which always makes my day much brighter And your caring and Encouragement Make my burdens seem a little lighter I admire your Ambitious goals so worthy And your keen and analytical mind Which knows and always Understands me. These things and much, much more I thank you for." Dr. Thibodeau has helped me tremendously with the adjustments for my neck, back, legs and knees. I have gone to Gonstead Chiropractors for a long time due to work related injuries of carpal tunnel in both hands, wrists and also tendinitis. Never have I received such good care until becoming a patient of Dr. Thibodeau. I appreciate the fact that my body is functioning much better now and his information and research for health foods is excellent. Organic fruits, vegetables and meats have improved my body. I am a colon-rectal cancer surgery survivor of nearly five years and celebrating my 71st birthday today. Thanks to the excellent care I receive here at his Soquel Chiropractic office, the doctors are amazed at my surviving cancer and my health. I am still active in my accounting business and anticipate working for many years in the future. Thank you Dr. Thibodeau for your concern and care."